Practice C++ questions and answers for interviews, campus placements, online tests, aptitude tests, quizzes and competitive exams. This section on advanced C++ programming questions focuses on “Container Design”. One shall practice these advanced C++ questions to improve their C++ programming skills needed for various interviews (campus interviews, walkin interviews, company interviews), placements, entrance exams and other competitive exams. These questions can be attempted by anyone focusing on learning C++ programming language. They can be a beginner, fresher, engineering graduate or an experienced IT professional. Our advanced C++ questions come with detailed explanation of the answers which helps in better understanding of C++ concepts. 1. How many sets of requirements are need in designing a container? Explanation: There are three sets of requirements. They are container interface requirements, Allocator interface requirements and iterator requirements. 2. Which interface in the container is required for storage management? Explanation: Allocator interface in the container is required for storage management. 3. Which is present in the basic interface of the allocator interface? Explanation: The basic interface of an allocator class consists of a set of typedefs, a pair of allocation functions, allocate() and deallocate() and a pair of construction/destruction members, construct() and destroy(). Explanation: In this program, We are choosing and printing the numbers based on the certain limit and this is a composite design pattern. 5. Which container provides random access iterators? Explanation: Vector & deque container provides random access iterators. 6. What is the output of this program? Explanation: In this program, We formed a simple container and got the size of it and printing it. 7. Which is used for manually writing lookup table? Explanation: Lookup table means storing values in a table with unique keys for each value so that can be checked in future easily. So for such lookup tables maps are used in C++. 8. How can the member functions in the container be accessed? Explanation: The container manages the storage space for its elements and provides member functions to access them, either directly or through iterators which reference objects with similar properties to pointers. 9. Which of the following type does the container should define? Explanation: Every container must define an iterator type. Iterators allow algorithms to iterate over the container’s contents. 10. Which are the parameters for the content of the buffer? Explanation: The contents of the buffer are initialized using the values from the iterator range supplied to the constructor by the start and finish parameters. 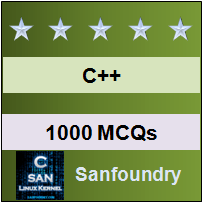 Sanfoundry Global Education & Learning Series – C++ Programming Language.